Aerating a lawn can deliver significant benefits. Soil naturally can become compacted, which results in it not holding enough moisture and air not getting into the soil. As a result, the naturally occuring microbes in the soil are unable to break down any dead grass. 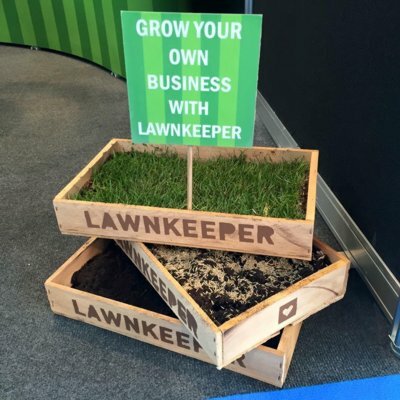 Healthy grass has a natural life-cycle where old grass dies and is replaced by young, healthy grass – but if the soil is too compact the dead grass doesn’t break down and develops into a layer of ‘thatch’. The layer of thatch makes it even harder for moisture and nutrients to penetrate the soil and reach the roots, which contributes to an even more unhealthy looking lawn. Lawns which have excess thatch are more susceptible to other diseases such as fusarium in autumn and winter or red thread in summer. 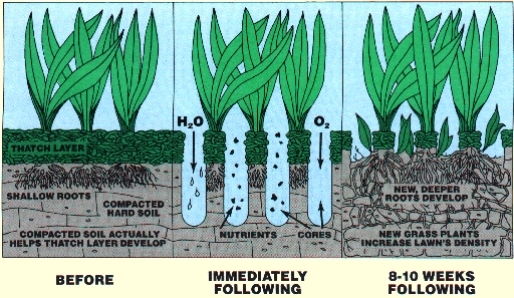 By aerating the lawn (see the diagram), water, C02 and other nutrients are able to reach the plant, resulting in healthier, stronger growth. September/October is a good time to aerate, so if you think your lawn would benefit please contact your local operator – see here for the areas we cover.